Grimsby consolidated their place in the Conference play-off spots by coming from behind to beat leaders Barnet. It was Barnet's second successive league defeat after they were beaten 4-1 at Lincoln earlier this month. "A fantastic win, and pleasing when there's aspects of the game that we spoke about, and the players carried that out and stood up to the physical battle. "We could have perhaps scored one or two more, but it's easier to say when you're on the winning side. "It must have been compelling viewing in terms of you never quite felt 100% relaxed because they throw men forward and you can see why they've scored a lot of goals. They've obviously got some good players. " Match ends, Grimsby Town 3, Barnet 1. Second Half ends, Grimsby Town 3, Barnet 1. Attempt missed. Michael Gash (Barnet) right footed shot from outside the box is too high. Attempt missed. Jon-Paul Pittman (Grimsby Town) right footed shot from the left side of the box misses to the right. Attempt missed. Nathan Arnold (Grimsby Town) right footed shot from long range on the right misses to the left. Attempt missed. 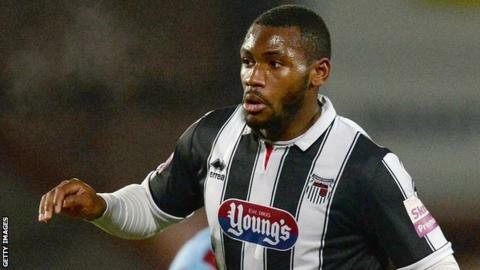 Lenell John-Lewis (Grimsby Town) left footed shot from the left side of the box misses to the right. Attempt saved. Lenell John-Lewis (Grimsby Town) right footed shot from the left side of the box is saved. Attempt missed. Aristote Nsiala (Grimsby Town) header from the right side of the box is too high. Assisted by Nathan Arnold. Substitution, Barnet. Luisma replaces David Hunt. Attempt missed. Ollie Palmer (Grimsby Town) right footed shot from the centre of the box misses to the left. Attempt saved. Ollie Palmer (Grimsby Town) right footed shot from the right side of the box is saved. Attempt saved. Mauro Vilhete (Barnet) left footed shot from the left side of the box is saved. Goal! Grimsby Town 3, Barnet 1. Jack Mackreth (Grimsby Town) right footed shot from the right side of the six yard box to the bottom left corner. Assisted by Ollie Palmer with a headed pass.